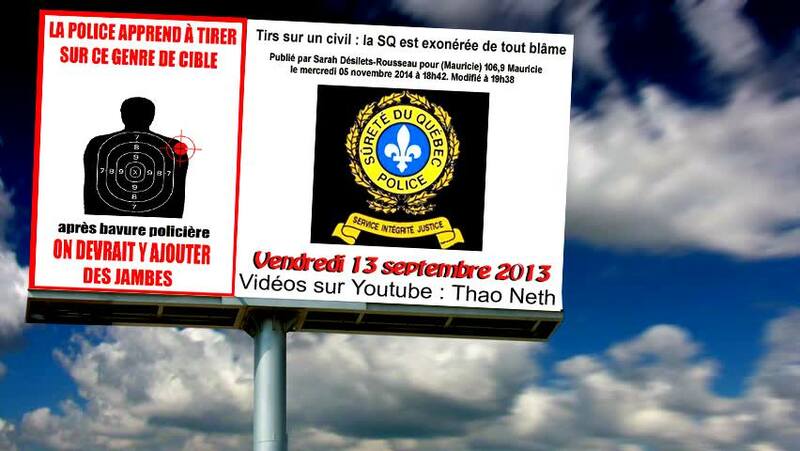 "tu veux te faire battre ce soir ?" | C.O.B.P. though it was never mentioned untill I was issued a ticket an hour or so later. I was sitting on the top part of a park bench to get away from rats in the park that were coming near my feet. (One of the police officers made a remark about the rats himself). The younger of the two officers that approached me made no mention about me sitting on the top of the park bench. When he approached me he said: "I don't know you". I was taken aback by his remark and replied that I didn't know him either. He said he knows everyone in the park, that he had never seen me before and that it was "his park". At that point I said I would be leaving. He said no and demanded ID. I said "are you going to shoot me if I don't?" Not the best choice of words in some people's opinion but considering him "owning the park" I found it to be appropriate since his attitude and actions were way out of line. Far as I'm concerned they shoudn't expect better all they're going to do is bully and initimdate people for the heck of it (which they inevitably did anyhow). The second officer stepped in and insisted on the ID. I asked what for and he would not reply but instead took a "what do you think" attitude. I was cuffed and at some point a 3rd officer showed up. This 3rd officer put on his gloves and said "tu veux te faire battre ce soir", "you want to get a beating tonight". He then said to the 2nd officer that he knew me. I was freaked out and said to the 2nd officer that I didn't know him. The 3rd officer said I had done a (some code or number) on him. He was highly agitated and at one point got right in my face. I said again that I did not know him, that I did not recognize him. I was really freaked out and so I mentioned some political acquaintances. This seemed to calm the situation a bit. The 3rd officer said to me that I had filed a report against him previously. He got comical at one point saying he was older than me (inferring he knew more than me) and at some point he left (the 3rd officer) since the other two had it under control. The 2nd officer wasn't done however and he made an insinuating comment about the material on my smart phone. Material about my health that is really none of this business to begin with. for my laptop being stolen since I had a criminal record from over 20 years ago (with no repeat or any offenses since over 20 years). I didn't want to argue and just left it at that. saying the way he saw it (seeing nothing). and said something like "if you're ok with us, we can be ok with you". me to kid around or if they were trying to intimidate me to not say anything about them or if they were trying to push their weight around in general. In any case I opted for the former since it was just easier to handle. I contested the ticket and left it at that. I received a notice on Dec 14 2012 to appear in court for the ticket. 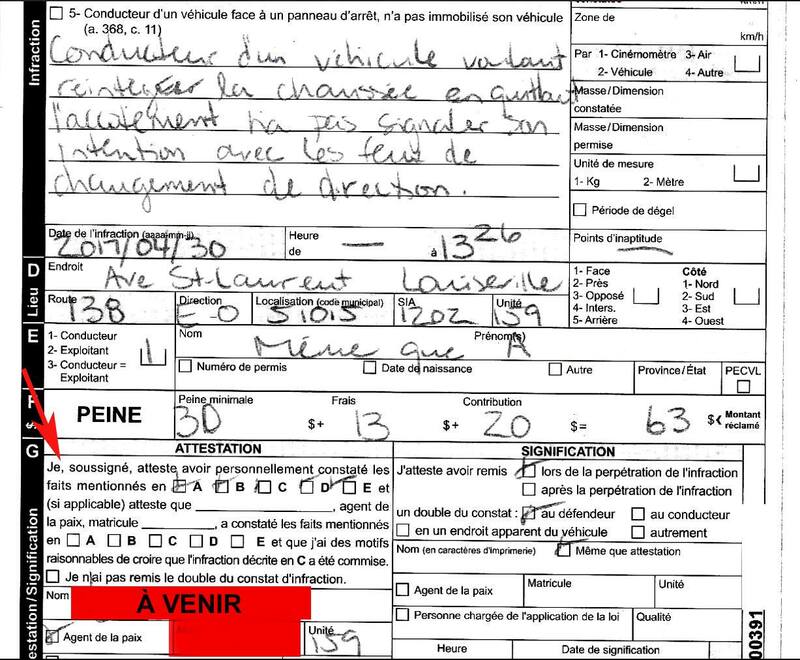 The city of montreal and in my view consequently the police, still want to "prove the point"
that they can intimidate, bully, ticket, lie in court and pretty much break the law and do whatever they want with impunity. It's worth noting that I receive minimum social assistance. I am about 150 lbs. I have serioius back and knee issues that have me in pain day after day. I have trouble (pain) walking. I do not receive medical treatment (no Dr, "just the way it is"). That's the person the police bullied, intimidated and now are looking to take 350.00 from. A man on minimal assistance partially crippled and living in pain for years. That's the person they got off on being "stronger" than.